In this film from 1947, Groucho co-stars with Carmen Miranda, "the Brazilian Bombshell". 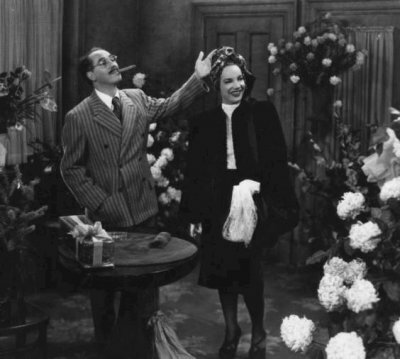 Groucho plays Lionel Q. Devereux while Miranda appears as Carmen Navarro. They are a double-act that have been engaged for ten years and now they fail to get an engagement at the Copacabana Club in New York. Devereux retires from stage to become Carmen's agent and now she passes the audition, both as herself and (in disguise) as the French singer Mademoiselle Fifi. Carmen and Fifi are booked to appear alternately on the bill, necessitating a series of quick-change acts every night. At one point in the film, agent Deveraux suggests a replacement for Fifi and in comes the "old" Groucho with greasepaint-moustache to sing Go West, Young Man (written by Bert Kalmar and Harry Ruby) amid a ranch setting populated by attractive cowgirls. This Groucho and Deveraux are clearly not meant to be one and the same, the one cheering on the other. In his The Marx Brothers Encyclopedia, Glenn Mitchell interprets this as the old Groucho rescuing the new in his time of need. The film Go West was originally developed in 1936 in parallel with A Day At The Races and the first outlines were written by Bert Kalmar, Harry Ruby and William Slavens McNutt. The song Go West, Young Man is probably a left-over from the original Go West. The saying "Go West, young man" was popularized by American author Horace Greeley, who favored westward expansion and is mentioned in the lyrics of the song. 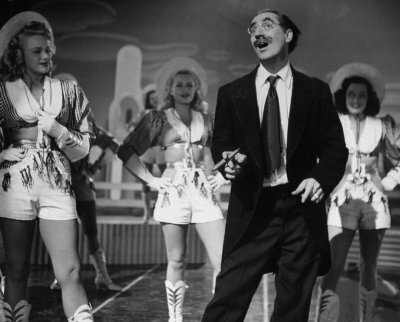 In 1952, Groucho recorded Go West, Young Man and a couple of his other trademark songs with the Ken Lane Singers, and there are various differences between the lyrics in the movie and the later recording (thanks to Jon Charles and Stefan Timphus for this info). Choir As the crow flies, when the snow flies, go, there's no "no"! Groucho The judges there are very fair, they always are of course!